Last Thursday I finished the intense 4 week period of my chemotherapy and I couldn’t be happier! I can’t believe I made it through. 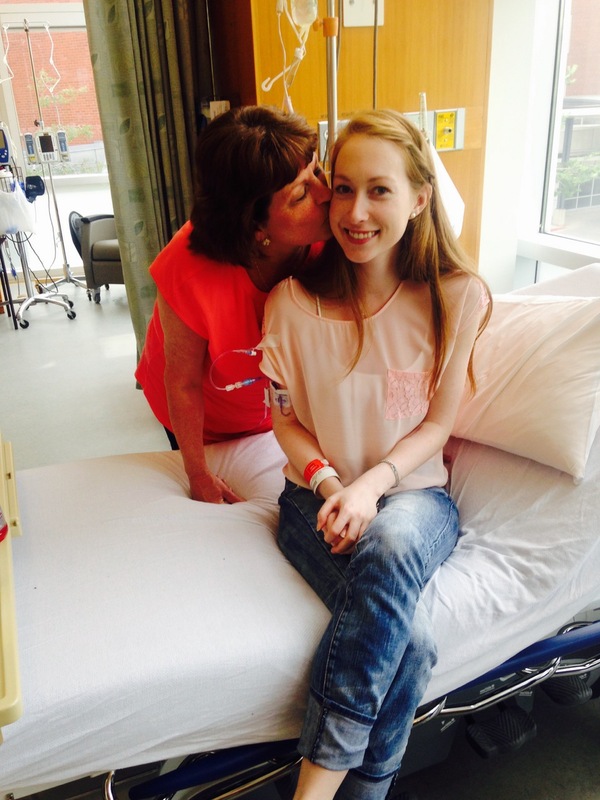 My mom and Emily came with me to the cancer centre for my last treatment and it was so nice to have them there. I said bye to all of my nurses, which was difficult after seeing them every day for pretty much 5 weeks straight. My nurses all signed a “graduate of chemotherapy” certificate which was so sweet and I really cherish it. Julie got me a beautiful card and new mug that says “Life is a story, make yours a best seller,” which I love!! My new friend Daniella got me yummy cake pops, a Hillsong United CD and a new devotional book to celebrate being done treatment. John and Linda, our neighbours and family friends, have been so kind to me throughout my whole treatment and they got me balloons to celebrate being done this part of treatment! Emily was so sweet and got me an engraved bracelet with Isaiah 41:10 engraved into it, which is the verse that I have been using ever since my diagnosis. Isaiah has got me through a lot, and Isaiah 41:10 says, “So do not fear, for I am with you; do not be dismayed, for I am your God. I will strengthen you and help you; I will uphold you with my righteous right hand.” How perfect is this verse? It is so amazing to literally wear one of my favourite verses on my wrist and every time I look down, I am reminded that my God is with me. Emily also made me a certificate for finishing treatment and framed it, which is so sweet and then I opened a gift that made me cry so much. 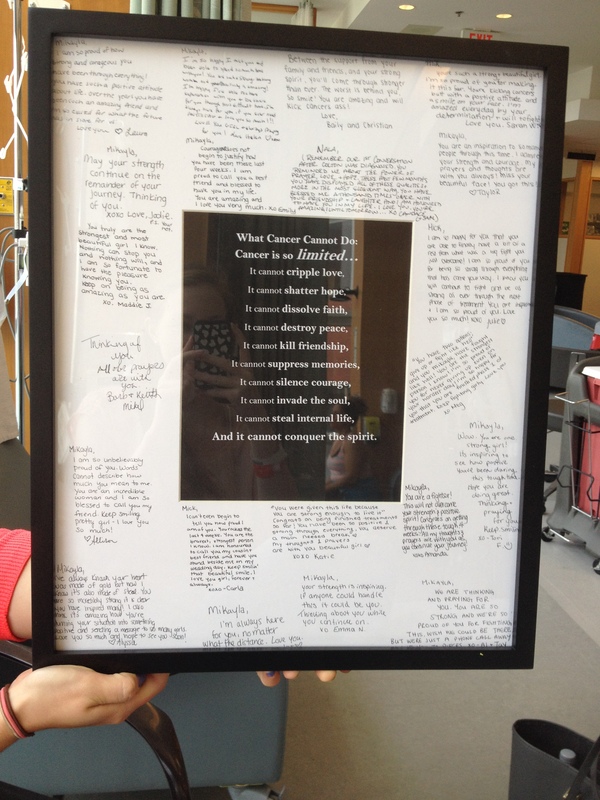 Emily got me a picture frame with an amazing quote about how cancer is so limited and got ALL of my friends to write a message for me! It is so amazing that Emily went around to meet up with all of my friends and that she came up with these amazing ideas of gifts to get me. I am so blessed to have her. I am planning on hanging the picture with the notes from my friends in my room so that every morning when I wake up, I can be reminded of how much my friends love me and be reminded that cancer is a limited disease. I feel like the fact that I’m now done this part of my treatment hasn’t really hit me yet, and it’s hard to really understand what has happened in the past three months. Last night I was telling my cancer story to some of my neighbours and I realized that what has happened in the past three months really has not fully hit me yet and I wonder when it will. It hasn’t truly hit me that I was diagnosed with cancer, had surgery and recovered from a difficult surgery while awaiting very important results and still managed to do a presentation, write 5 papers, a quiz, and 4 exams all while maintaining good grades. It hasn’t hit me that I just completed a really difficult treatment, that some people have to stop because it’s so hard on the body. It hasn’t hit me that I had to go to the cancer centre every single day for 5 weeks for 3 hours a day to receive treatment for my cancer. I know that none of this has really sunk in yet, and perhaps I just need more time, but I am proud of myself. When I write it out like this, it really puts things into perspective and helps for everything to sink in. It is truly unreal what has happened in my life in the past three months and how much my world has been turned upside down in the past three months but I am so thankful for everyone who has stuck by my side since my diagnosis and thankful to have made it through such a difficult treatment. My nurses all told me how well I did with this treatment and my oncology nurse told me that I am in the higher percentile of patients who have been on this drug because of how well both my body and I handled it. And I may have set a new statistic or record with having appendicitis in the middle of my treatment! I am very confident that the Lord was fighting through me during this difficult time and I believe that is how I was able to handle chemo so well. He has never abandoned me and has been with me every step of the way so far. I am eternally thankful. So what is my life like since finishing treatment? This past weekend I celebrated my cousin’s wedding where I was her maid of honour! It was amazing to feel good, stand up with her and to celebrate her marriage. For now I’m enjoying not having to go to the cancer centre every day. My next three weeks are filled with appointments, but it’s still nice to not receive chemo every day. My body is recovering well and bouncing back very quickly, which I am very thankful for. I have three weeks off (with no treatment) and then I begin self-injections that I will receive three times a week for 48 weeks. I am trying not to think and stress about the next round, although it is hard, because I know that I have to do what I have to do, which is this. I have a prayer request for my continued health and overall well-being. I will be updating my blog as I continue on this long journey. Thank you for the prayers, well-wishes and for reading my blog, I truly appreciate it! Way to go Mikayla!!!!! I am so proud of you. Your faith and the love of others will get you through. you are always in my prayers and thoughts! You are such a sweetheart! Whether the past events sink in or not, you do realize what is important: you moved successfully through it all and the past is now the past. Not all of what lies ahead may be pleasant but you will move through it all. I have a newspaper clipping which I keep in my jewellry box. I want to share part of it with you. It is called “Attitude”. ” Attitude to me, is more important than facts….. The remarkable thing is we have a choice every day regarding the attitude we will embrace for that day…. I am convinced that life is 10% what happens to me and 90% how I react to it. And so it is with you; we are in charge of our attitude.” God bless. So proud of you and how well you made it through this difficult time. You looked amazing in Carla’s wedding photos. Good luck with the next round of treatment. Will thinking and praying for you.